With grass cutting season well underway, it’s time to dig your lawnmower out of the shed, dust it off and get mowing. If you find your trusted mower has given up the ghost and it’s time to look for a new one, you might be wondering which direction to take. There are so many lawnmowers on the market now it can be a difficult decision, but luckily for you, this guide is going to help you pick the right one so you can enjoy a beautiful lawn all year round without too much effort. There are many factors you have to consider. The size of your garden is going to determine which category of moweris appropriate. For example, a small or medium-sized garden is best suited to a mains powered electric mower. They’re easy to use, quiet and fuss-free. For larger areas, you’re better off considering a cordless electric or petrol machine. There are a wide variety of lawn mowers, but each has its own set of pros and cons. Here are the most common. 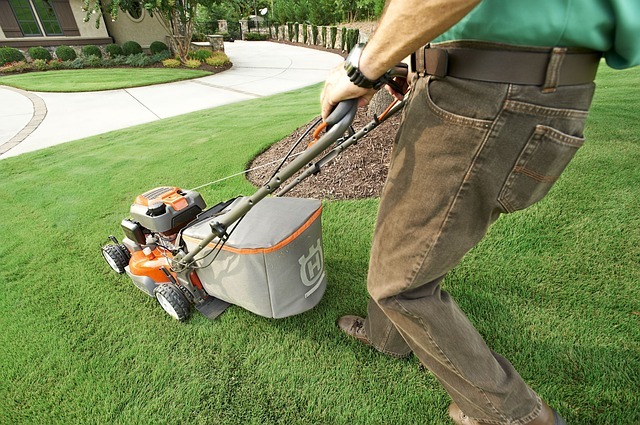 Cylinder– this mower uses a set of cylindrical blades that rotate vertically at the front of the mower. If your lawn is flat and you want to keep the grass short and well-manicured, this is a good option. The cylindrical blades cut the grass like this because there’s also a fixed blade at the bottom that they cut against. For an efficient cut go for a cylinder mower with three or more blades. This type of mower can be electric, petrol-powered or manual. Rotary– a rotary mower has one single blade that rotates horizontally, much like the propellers of a plane. If you’re looking for a versatile mower, this is the answer. It’s able to cut most types of grass efficiently. If your lawn is made up of longer and rougher grass, a rotary mower will be better than a cylinder one. Hover –if your lawn is an unusual shape a Hover Mower is a good choice. It also tends to be cheaper than the other mowers. It’s a mower that hovers above the ground, hence the name, and is easy to push over uneven surfaces. All of these mowers can be found at a reputable garden machinery stockist such as Sims Garden Machinery. There are a number of other factors to bear in mind when choosing your lawn mower. If you want your lawn mowing task to be made easier, then you need to look for a self-propelled mower. The advantage of these is that you don’t need to push them. The only effort required from you is to steer them in the right direction. To make life even easier, some models have an adjustable speed so you can set it to your own walking pace. Another option is to buy a mower with a grass box. This saves you having to rake up the grass clippings when you’ve finished mowing the lawn. If your garden is on the large size look for a mower with a high-capacity grass box to cut down on the number of times you need to empty it. If you’ve got nowhere to dispose of your grass clippings, a Mulching Mower might be the answer. The clippings are chopped up very finely and pushed back into the lawn.Now you’re armed with all the essential information you can make the right decision and enjoy mowing your garden for many years to come.